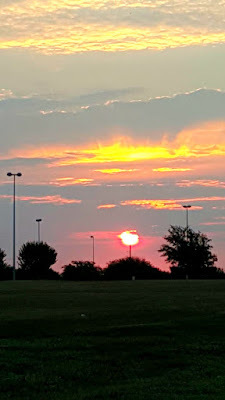 Getting to see a beautiful pink sunrise is a nice perk of a long run - we saw this as we neared mile 5 on Saturday morning. Photo credit goes to CC - she stopped to take the picture while Loretta and I kept chugging up the hill. I'll be honest - I was not looking forward to running 8 miles on Saturday. Traditionally, 8 miles is when the hurting begins, both during and after the run. But, I did the old "fake it til you make it" thing and pretended it was going to be great, and you know what? It wasn't bad. There were several long slog hills on this route, including my personal nemesis, Harvey Hill, which I've hated doing for years now. However, CC had found a video that talked about how to do hills without getting tired, so we tried to concentrate on doing them this way. Here's the link, but basically we focused on standing up straight, looking ahead (vs at the ground, which is easy to do when you're running up a hill), taking short, choppy steps, and keeping our feet under our bodies instead of taking longer strides. We reached the top of Harvey Hill and amazingly, we all felt good! And this was at mile 5, so it's not like we were on fresh legs at that point. We had a nice downhill after that, and then a couple more hills, including one where we have usually lost Loretta...it's always toward the end of the run, and it's a bear. I get to run it every Thursday with Cary, so I'm more used to it, but normally Loretta is cussing and lagging on that one. Well, not this time! She stayed right with us, and, not that we care, because cussing goes very naturally with long runs, Loretta didn't even swear! Except for mile 2, that was our fastest mile of the day, as well! I was surprised to see my old trainer's van in the parking lot of the park when we finished our run - Brad had just led a group in a workout there. It was nice to see him and it felt like I came full circle, as I started running when I was working out with his group, and even ran my first mile there...nearly six years ago to the day! 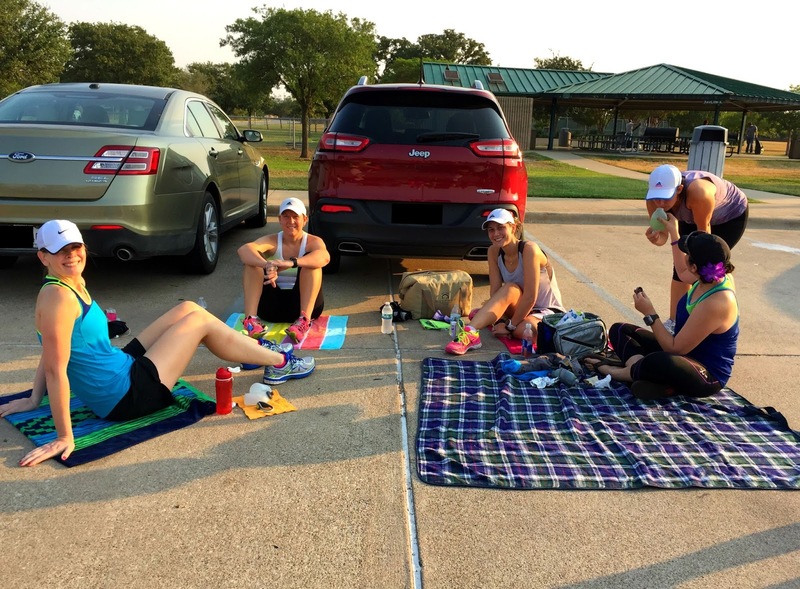 I took this shot of my friends relaxing after their run. But once I uploaded my pictures, I realized I caught Julia in the process of doing a "here, smell this, it's gross" thing...she'd bought a bottle of Lime Cucumber Gatorade, and it was awful. I thought it smelled like dirt; others likened it to something you should be putting on your body, like lotion, instead of trying to drink it. We split a cinnamon roll and a cinnamon twist, YUM! This girl ran her first 8 miler and celebrated with chocolate milk and a breakfast croissant! I came over here expecting to see your post title be 8 Effing Miles LOL!! I knew you were sort of dreading this. I am glad it wasn't as bad as you thought it would be. And lime cucumber gatorade just SOUNDS gross!! LOL, I know - I really thought I'd be more irked at the 8 miler, too! I know tastes vary, but seriously, EVERYONE hated the smell/taste of that flavor of Gatorade...which makes me wonder, where are all the people who liked it enough to make it into their rotation? That's so awesome! Glad you found a better way to do hills. You go girl: tackle those hills! Well done! Glad to read that you had a good run last Saturday. It felt so good to not only have a good run, but have success with the hills! For real on the walking of hills! Never easy. Great job on your run! Keep up the good work. That bit about making the hills easier is really interesting. I have done most of those things when walking the hills around here, especially the short choppy steps! Looking ahead is one I have to constantly remind myself of. I'm glad you guys found something that was so helpful to you. I can't believe you started running six years ago!! Not only was that technique helpful, it helped to have three of us doing it, because invariably we'd forget, but someone would always remember. And yeah, I was surprised to see the date of my first mile, too! Feels like forever, and then again, it feels like I just did that. I have never tried candy mixed in with popcorn. I'm an either/or person. I prefer popcorn, followed by M&Ms. Or Junior Mints. Then I usually need a little bit more popcorn so the salty can wipe out the sweet. It can be a vicious (but enjoyable) cycle! LOL, exactly. The ratio is usually two M&M's to about 4 mouthfuls of popcorn. That gatorade sounds so nastay. Yuck! For the longest time, I used to think that singer's name was M&M. I had never seen it in print, just heard it. Then I felt stupid when I saw it spelled out. I love your group of runners - you seem so encouraging of each other. I also really love the food pics - yumyum! We do have an encouraging group, and I appreciate it a lot! Oh congrats! You did so great. I have a nemesis biking hill. I end up going so slowly it's hard to keep the bike moving in a straight line. I'm not sure where I'm looking though, I'll have to think about looking ahead. I can imagine how hard it is to keep a bike going uphill like that! At least with running, if we slow down too much we're still on the same two feet...not a lot of wobbling going on, luckily. Yay! So happy to hear that the 8 miles went well! And yes...M&M's sound like a GREAT fuel!